The Murchison meteorite is making headlines ever since it plummeted to earth on 28 September 1969. A whole host of organic compounds (alkanes, amino acids, carboxylic acids ) have been identified in its interior which supports the theory that the building blocks of life arrived from outer space. In one estimate infant Earth was bombarded with an annual 109 Kg of organic matter. Detecting organic matter in meteorites is difficult because it is present in trace amounts and because either the meteor itself is contaminated or contamination sets in as a result of chemical processing. An infamous example is the Orgueil meteorite. Novel research from no less than 7 research centers sets the record straight for the Murchison meteorite with respect to uracil, one of the building blocks for RNA. A study (Martins et al. 2008 DOI) looks specifically at uracil's content of Carbon-13. This isotope makes up 1.1% of carbon on Earth but in space this concentration is much higher due to constant cosmic bombardment (compare to carbon dating). The researchers were able to lay their hands on 15 grams of the meteorite and in order to rule out contamination they cleverly collected a soil sample from the original Murchison location. 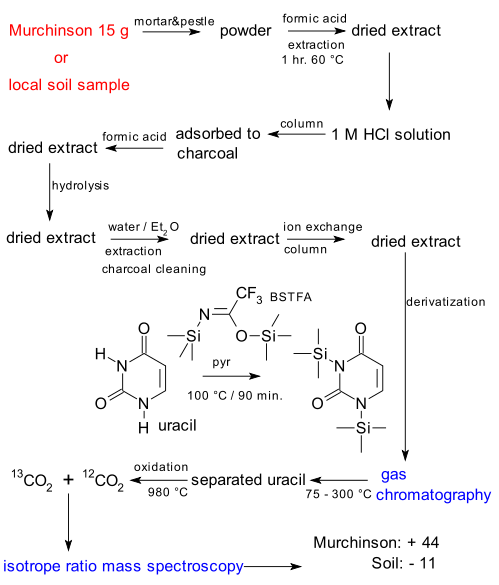 The analytical process is extremely complicated and involves multiple rounds of extraction, a hydrolysis step (not even included in the experimental procedure), chemical derivatization and ultimately a combination of gas chromatography which isolates the uracil and then isotope ratio mass spectrometry which separates 13CO2 and 12CO2 after oxidation of the uracil. The publication is hopelessly fuzzy about its definition of carbon-13 enrichment but lets say uracil in the meteorite is 44 promille up while that in the soil sample is 10 promille down compared to a reference sample. The researchers are thus confident that the Murchison uracil payload is indeed extraterrestrial and this concurs nicely with earlier similar research on the amino acid content.